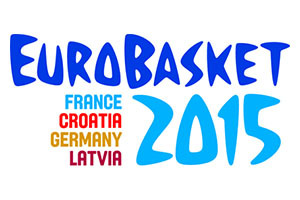 Group A at the 2015 EuroBasket got off to a flying start with one game going to overtime and the other two games being decided by 4 points and 3 points. There were some thoughts that there would be a couple of runaway victories on the opening day of the group but these results suggest that there will be plenty of drama and excitement in Group A over the rest of the week. The upheaval experienced by the Russian side in the build-up to this game clearly had an impact on the team with the Israeli side managing to dig in and get a great start to their campaign. However, the story of the day in Group A came in the final game with host nation France needing overtime to get beyond Finland. An exhilarating final quarter from the Finnish forced the game into additional time and while the French were shocked, they just about got there in the end. Andrey Vorontsevich delivered 15 points for the Russians but too many of their big name players failed to turn up for the opening game. The Russians started well but faltered badly after half-time, and this is something that they’ll need to rectify in their second game. Mateusz Ponitka was the main man for a Polish side that got off to a flying start against Bosnia and Herzegovina but it was Adam Waczynski who grabbed the game high of 15 points as the Polish side took control in the second quarter. In the end the Polish team were hanging on, so they’ll need to strengthen and be tougher in the final stages of this game. Expecting the Russians to perform better than they did in their opening game, take the Russians with a +2 handicap at odds of 1.90. If you fancy the Over/Under market, go UNDER 147.0 with odds of 1.90. Bet Now! Jamar Wilson, with 21 points, was the top points-scorer for the Finnish side who showed a great deal of strength and tenacity in coming back against the host nation in Group A. The Finnish side were massive underdogs in their opening game, but they handled this situation very well. In this game, they will need to show that they have the mental strength to battle an opponent who is at a similar level. A 17-0 run in the second half was the turning point for this game and Omri Casspi delivered eight of his 21 points in the third period. This will be another game that the Israeli’s think they can win and if they grab two wins out of two, they will be well placed to make their way through to knock-out stages. Finland should be buoyed by their showing against France so take the Finnish side with a handicap of -2.5, at odds of 1.90. For the Over/Under market, go OVER 154.5 at odds of 1.90. Bet Now! Bosnia and Herzegovina looked as though they were going to be on the end of a sore one in this game but in the end, they made a real game of it in the fourth quarter. Sharp shooting and robust defending almost allowed them to turn the game around and given that the French team wobbled late on, Bosnia and Herzegovina will be keen to hang on in their until the last quarter and then see if they can force the issue and grab something against the hosts. France will feel as though they had a good 30 minutes in their opening game but the fact that they came under so much pressure in the time that they switched off indicates that this is still a work in progress for the Group A hosts. Tony Parker grabbed a game best of 23 points and he will likely be a big player on Sunday as well. Given the way that France were hotly tipped in Game 1 but just about got through, look to take Bosnia and Herzegovina with a handicap of +16.5 at odds of 1.90. If you are looking to choose the Over/Under market, go OVER 147.5 with odds of 1.80. Bet Now!